id's "Doom Eternal," one of the first Stadia games. 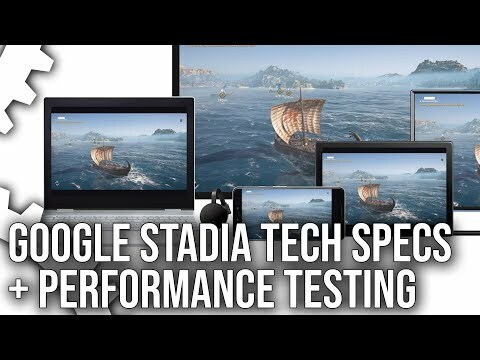 Players will experience minimal input lag, and load into titles within seconds through links on sites like Twitter, YouTube, and the Stadia Store, Google said. Gamers will even be able to shuttle between platforms within moments, for example jumping from a phone to a Chromebook to a TV-connected Chromecast Ultra. While people will be able to use existing gamepads and other controllers, Google is also planning to ship the Stadia Controller, an Xbox-style gamepad with dedicated sharing and Google Assistant buttons. The accessory will connect directly to the server running a game via Wi-Fi and detect when a person switches devices. At launch, Stadia will support graphics up to 4K resolution at 60 frames per second, sharing to YouTube in the same quality. Long-term the goal is 8K resolution and 120fps or higher, at least on the player's end. Each Stadia server instance is expected to have far more power than an Xbox One X or PlayStation 4 Pro, thanks in part to a custom AMD graphics chip that appears to be equivalent to a AMD Vega 56. Google is moreover partnering with the creators of middleware platforms like Unity, Havok, and Unreal, the idea being that Stadia can be treated as its own development platform with cross-platform support. 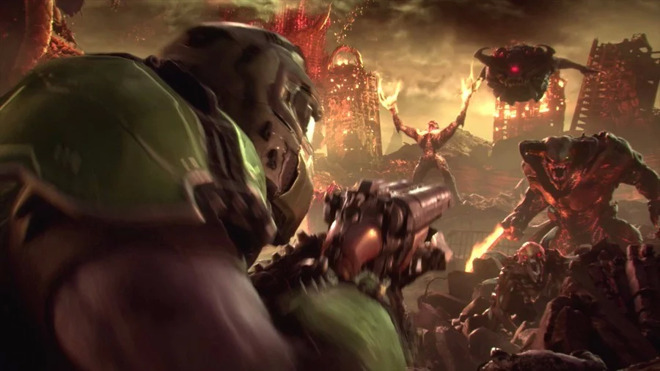 Some early Stadia titles should include id Software's "Doom Eternal" and Ubisoft's "Assassin's Creed Odyssey." The latter served as a test during last year's "Project Stream" experiment. Google is pitching Stadia as an ideal multiplayer environment, since each player connects directly to Google servers, and there are fewer limits on shared experiences -- the company used examples like destructible environments and battle royales with thousands rather than hundreds of players. It should also make local "couch" multiplayer easier to implement, and Google is promising to let people watching YouTube streams participate through "Crowd Play," simply queuing up behind others wanting to join if a streamer allows it. Indicating the seriousness of the platform is the creation of Stadia Games and Entertainment, Google's first in-house game studio, led by veteran developer Jade Raymond. The Stadia service should launch sometime in 2019 in the U.S., Canada, and "most" of Europe, including the U.K. It's unknown how or how much gamers will have to pay for access. The stat Google is touting as Stadia being more powerful than a PS4 Pro and One X is a bit silly. It's a streaming platform. I checked out the announcement and it was pretty funny the latency issues during the demo. I'm highly skeptical Google can keep latency as low as they are claiming. No current cloud services have 0 latency. Stadia may work fine for single player games, but no way there won't be latency issues playing a game like Battlefield V.
I want something like this to be subscription based. Hopefully they bring this to iOS,tvOS or Mac. According to Google latency won't be an issue for multiplayer. They had a segment of the presentation where that was discussed and the reasons latency won't be the problem some are expecting based on current gaming platforms. It will still be a few months before you can see for yourself if it's a problem or not. Heck, Microsoft thinks it's the way forward too and creating their own version of it. FWIW I didn't see the "funny latency issue" you were mentioning but the livestream is still available to look at it again. The presumption would be that it is intended for iOS/Mac too based on comments during the presentation." I don't think "cross-platform" will mean just phones and tablets and computers and TV's. Those computers are running some OS. As long as you can use a recent Chrome browser I think you're OK. The computer specs and hardware are not really important. My T-mobile/Sprint connection has difficulty keeping up with just location data on some iOS games. About as long as it takes them to produce their first Google branded 1st party PC game. It actually doesn't matter what Google shows during a presentation regarding latency, and I'd expect it that latency to be low since they would be "close" in geography and infrastructure to the server. Latency is a byproduct of the individual's (frequently unique) combination of hardware and connective network services - it's why Youtube is fast for some and not others - not because Google's Youtube servers or CDN are poor. Powered by AMD EPYC and Vega VII GPGPUs in the Cloud with ROCm. Cool. What sort of privacy data do I have to sacrifice for their ad business? Time of day and Internet traffic affects latency and bandwidth more than any of those things you mentioned. I have 100 mbit/sec FIOS in NYC which is great except when it's not. There are times when Youtube barely works so I check the little 'How is my connection?' and Youtube shows me that everyone happens to be on Youtube at the same moment which creates a terrible experience for all, especially someone trying to initiate a new stream. I'm not saying that this will fail or cannot be technically done, I'm just saying that there are some things that Google cannot control so users have to be prepared for some letdowns. Digital Foundry did a good vid on the behind the scenes aspects of Stadia. We also need calls on what it will be renamed to, before it shuts down! Chrome browser - not interested in a million years to install that spy on my systems. This has the best chance of succeeding. Using the newer QUIC protocol to cut down on latency, this may actually have a very good chance. People complain about latency, but a lot of console gamers don't even enable game mode on their tv. Of course this isn't going to be an option for the 'leet pro gamers' as those shooting games need every bit of latency removed. For the other 99% of games and gamers, this could be perfect. Early testing shows there are latency issues with Stadia. I don't think it will be any different when it comes out. There are too many variables such as internet speed, TV/monitor, etc. I read quite a few people complaining of input lag playing Doom at the demo area. I really don't see who the target audience is for this. Gaming on a PC/Console will still be a way better experience.